and Client running on a variety of POSIX-based platforms. It has been mainly developed by Matt Johnston (see matt's web site). 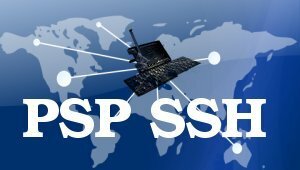 PSPSSH is a port of the version 0.48.1 to the PSP. This ssh client gives you a remote access to your PC (if you have a SSH server installed of course), and you can then enter commands and run scripts as if you were directly in front of your PC. of Danzel for his Telnet client for PSP. licenses, and mainly the MIT/X Consortium License. See LICENSE.txt file for all details and information about it. BTW, I've used pspssh-v1.2.0-fw15.zip on 4.01 M33-2 fw.. It's connected fine. then it was just blinking cursor mark at the upper left corner of screen. It is possible to exit to graphical screen, but couple of minutes later it hangs, and restarts psp. it was 'root' login for it. ...And link to ssh2 qj's forums says, - "Not Found". what's the host : what should i write in it ???? Hi, I'm using 5.00 m33-6 cfw and when I launch pspssh, the psp logo appears, then it proceeds to read the memory card for a few seconds with a black screen. It then returns to the XMB. My wireless connection is just fine as I can use it in the web browser. Is there something I am missing? Are there any special settings that need to be enabled in recovery mode? Thanks. You have to unzip the fw5x archive in your psp/game5XX folder. It runs just fine on my psp using 5.0-m33 v6. Btw, you can disable all plugins and see if it works better ? I'm sorry, but neither of those worked. I'm using a slim PSP if that has anything to do with it. There wasn't a folder called GAME5XX, so I made one, but no luck. I disabled all plugins, no luck. I also tried one of your other apps (the text editor) and it gave me an error (8001001c). After google'ing, the answer was the memory card wasn't formatted right, so I used a spare memory stick, formatted it through the PSP. This time there WAS a folder called GAME5XX, however, the app still didn't work. Is there a debug mode for this at all?! Thanks guys. Has there been any progress yet? Any way I can help? With your permission, I would like to include this app in my senor project for Networking. Thanks. Problem solved. Somehow the permissions on the usb drive were incorrect. I use Linux and the permissions only allowed root access. Weird , huh? Make sure all of the permissions are correct! Thank you soo much! I have a problem that seems to be a old problem from past versions. Ive been perusing the posts but haven't found a valid fix. Problem: When launching PSPSSH the program finds and connects to the wifi, once at the main screen the option to connect is selected and the yellow text say "Connection Succeeded" - the screen then comes to a screen with a flashing cursor for 15 seconds and then the PSP Reboots back into the Default OS. Great App!!! Thank you very much! i had asimilar case, it has something to do with /etc/ssh/sshd_config settings. i found out by comparing the two ssh servers. one was linux, which am able to connect successfully and the other was freebsd which it failed. Got hint by reading this thread. Thanks again for this Great app. My log never shows a connection - Nor does my routers firewall show a tunnel hitting the public IP at the time that i attempt the connection. Using PuTTy with the same port, ip and username and password puTTy connects with no issue so i know the IP port and tunnel are good. PS Ive been trying Versions pspssh 1.07 - 1.2 on 3.5 mm33 - 5.00 m33-6 which is the current version im on. But I have one little problem. When I try to use Midnight Commander or rtorrent on my linux box, my D-pad do not work like standard arrows, but like some other keys (can't tell now like which one). Is it a bug or something with my setting? I use default setting, I didn't change anything. But when I'm in my console D-pad works just fine (up/down). First, thanks for this wonderful tool, it really rox ! I exactly have the same issue using mocp, very disturbing. By the way, is there any other way to simulate UP/DOWN arrows using Virtual keyboard ???? Is there any way to force those arrows on D-pad modifiying settings ? Arrows should just work fine if you set term to vt100 on your linux shell. it worked but does not fix the dpad arrow issue. I am trying to use my psp to manage a console music player (moc) under ubuntu 10.4. Everything is working very good except than very ennoying issue. Is there any way to force keys attribution, as I can create a custom keymapping for my very own use ? There is no way to modify the default mapping or to add custom keys. The key UP, Down, left right are mapped to vt100 escape sequences (ESC[A etc ...). By the way, is there any way to make the homebrew support UTF-8 encoding? My linux runs in the unicode environment, and under some unicode filenames are not displayed properly. It would be great pleasure to make this possible.